Slammer‘s debut, The Work Of Idle Hands, has aged considerably well, with it’s professional production and solid foundations belying it’s semi-forgotten status. With a street-smart atmosphere pervading throughout, and Paul Tunnicliffe’s convincing raspy vocals giving each track an urbanised edge, the likes of “Tenement Zone” and the expansive “Hellbound” stand-out from the pack….but the entire album is worthy of your time. 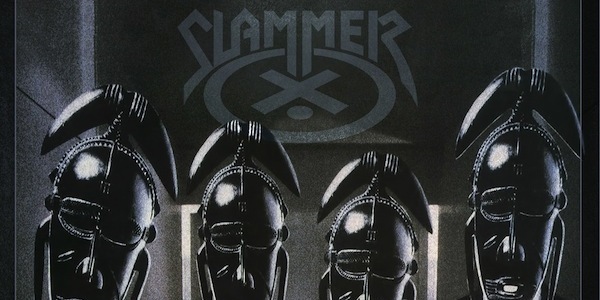 Slammer’s sound may not be original, but they were damn good at what they did and if consistently impressive and aggressive guitar work is your bag, you’d do well to hunt down a copy. But beware, this really is a lost classic and hard to track down at a reasonable price! Highly reminiscent of Testament at their most accessible, Slammer had a sound that was tailor-made for the American market and should have lead to significant album sales and worldwide recognition. 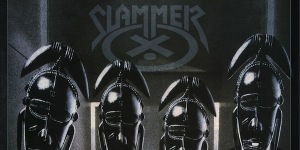 As it turned out, Slammer were just another British thrash band who should have made a big splash on both sides of the pond but failed to make more than a ripple; only with hindsight can we see they had much more to offer. If you liked this, check out: Insanity Addicts (1990) was Slammer’s second EP and a decent stab at taking their sound into more marketable areas. The UK. Home to more than just fish 'n' bloody chips!